Summary: Georgia’s parliamentary election on October 1 will be its most important since the disputed polls of 2003 and is being closely watched abroad, where it is being seen as a test of how Georgia can manage a competitive election process. 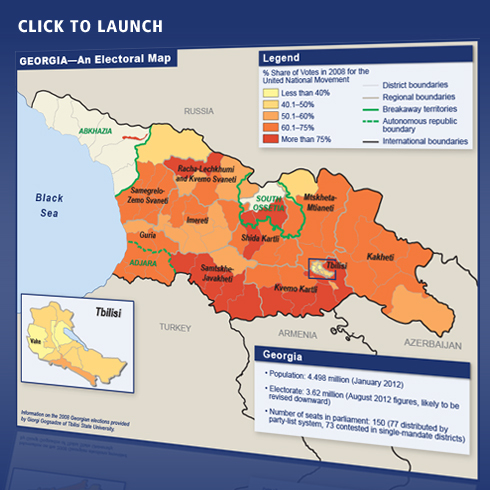 Georgia’s parliamentary election on October 1 will be its most important since the disputed polls of 2003 which led to the Rose Revolution and the subsequent election of Mikheil Saakashvili as president. The governing party, the United National Movement (UNM), is seeking to win a majority for a third time. The emergence of the Georgian Dream coalition led by billionaire Bidzina Ivanishvili poses the most credible challenge yet to the elite that has governed Georgia for more than eight years. The election is also being watched closely abroad where it is being seen as a test of how Georgia can manage a competitive election process. Speaking on a visit to the country in June 2012, U.S. Secretary of State Hillary Clinton told President Saakashvili, “the single best thing Georgia can do to advance your security, your prosperity, your democracy, your international reputation, is to hold free and fair elections that result in a fully democratic transition.” Both the government and opposition are also engaged in a parallel contest for approval in Western capitals, helped by well-known PR firms. Interactive Map The Georgian parliament has relatively modest powers, but this is also a shadow leadership election. In 2013, when Saakashvili ends his second and final term as Georgia’s president, a new constitution adopted in 2010 immediately takes effect. This transfers most of the executive powers currently held by the president to a newly powerful prime minister, who will form the government. The prime minister will be chosen by parliament, which thus hands important powers to whichever political force obtains a majority in parliament in the October 1 elections. A new president, to be elected in a separate election in 2013, will remain head of state but have more ceremonial powers and the role of constitutional arbiter. Until recently there was much speculation that Saakashvili himself would seek the prime ministerial job and thus try to remain the most powerful person in Georgia—speculation Saakashvili fuelled by refusing to rule the option out. However, the plan apparently launched by the governing elite sets out a different scenario. On June 30, veteran interior minister Ivane (commonly known as Vano) Merabishvili, long regarded as the second-most powerful man in Georgia after Saakashvili, was appointed prime minister. Since then the UNM has formally nominated Merabishvili to be its candidate for prime minister in 2013. The economy is by far the most important issue for Georgian voters. In a recent survey, respondents listed jobs, affordable health care, poverty and pensions as being four of their top five priorities, along with territorial integrity. To address these concerns, Merabishvili has unveiled an ambitious four-year program, with an emphasis on social spending that departs from the Georgian government’s more laissez-faire liberal economic policies of recent years. The new course is clearly a response to the rise of the opposition Georgian Dream coalition led by the country’s richest man, Bidzina Ivanishvili. Ivanishvili turned the political scene upside down in October 2011, when he declared he was entering politics with the aim of winning the parliamentary elections and becoming prime minister. Unlike previous opposition contenders, Ivanishvili had two attributes that made him hard for the governing elite to contend with: money and power. Most polls still put the United National Movement in the lead, but the Georgian Dream coalition is attracting significant support, especially amongst those parts of society which have felt alienated by Saakashvili’s policies. These include the unemployed and the professional classes in Tbilisi among others. The main tenor of Ivanishvili’s campaign is a greater emphasis on social fairness, with promises to provide greater government support for agriculture, job-creation and healthcare. The two main contenders in the election are broad coalitions, rather than homogeneous parties. Without the high-profile leaders, Saakashvili and Ivanishvili, at their head there is arguably little that holds them together. Like most post-Soviet governing parties, the United National Movement commands loyalty for both ideological and bureaucratic reasons. 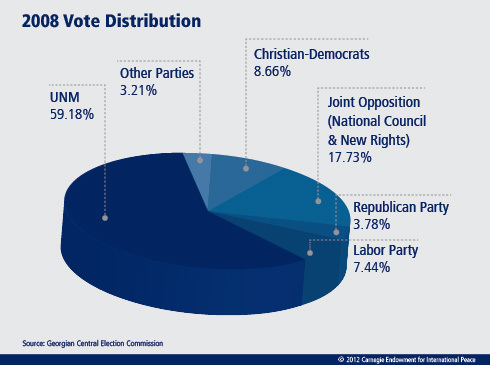 Georgian Dream is a diverse group of six parties which range from economically liberal and pro-Western to nationalist. Government supporters respond that it is normal to have mechanisms to restrain a man whose wealth is equivalent to around half of Georgia’s GDP and hint that Ivanishvili is acting with the support of forces “outside Georgia,” in other words Russia. Our map illustrates this polarization between the capital and the countryside. If the election is close or contested, this issue could become even more divisive. The outcome of the election is hard to predict. Opinion polls consistently give the advantage to the ruling party, but have given fluctuating information, from which both government and opposition can take encouragement. An independent poll commissioned by the National Democratic Institute in August gave the UNM a clear lead, with 37 percent of the vote against 12 percent for Georgian Dream. However, it also recorded a drop in support of more than 10 points for the UNM since February, and showed 43 percent of voters responding either as “Don’t Know” or as “Refuse to Answer,” an increase of 10 points since February. If many voters are indeed undecided, or not volunteering an opinion, this suggests that there is still much to play for before October 1. United National Movement Founded by Georgia’s President, Mikheil Saakashvili in 2001. The current governing party won 119 of the 150 seats in the last election in 2008. Current speaker of parliament David Bakradze heads the party list for the 2012 election. The UNM campaign trumpets the economic successes of the past eight years but also offers a more populist program than previously, pledging investment in road-building, tourist and hydro-electric power and promising Georgian families vouchers worth 1,000 GEL (around $600). Georgian Dream A coalition of six opposition parties formed by Georgian billionaire Bidzina Ivanishvili and named after a song by Ivanishvili’s rapper son, Bera. Its constituent parties are: Georgian Dream-Democratic Georgia (Ivanishvili’s own party); The Republican Party, a veteran liberal party; the pro-Western Free Democrats, led by Irakli Alasania; The National Forum, a populist party with a regional focus; the Conservative Party, led by nationalist politician Zviad Dzidziguri; and the pro-industry party, Industry Saves Georgia. Georgian Dream is building its campaign on a strong rejection of rule by Mikheil Saakashvili and promising a change of course on four domestic issues: jobs, education, healthcare, and agriculture. Christian Democrat Party A center-right party led by Giorgi Targamadze, which forms the main opposition group in the current parliament but risks being squeezed after the emergence of Georgian Dream. 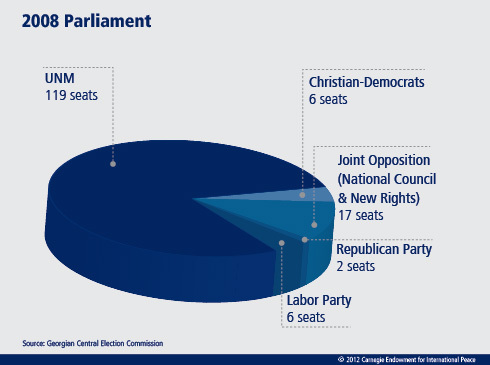 The party calls for a greater role for the Georgian Orthodox Church in public life. The party, along with New Rights, has been accused of being a “loyal opposition” to the government. New Rights Party Led by David Gamkrelidze, a veteran of all Georgian political campaigns since 2003, it orients itself as a right-of-center party and is well known for advocating the creation of a constitutional monarchy in Georgia. Labor Party Populist left-wing party led by firebrand politician Shalva Natelashvili. Won six seats in the 2008 election and will aim to repeat this performance. Natelashvili has promised free gas and electricity for voters and also accused the current government of being under the paid influence of George Soros. Mikheil Saakashvili President of Georgia since 2004, swept to power by the peaceful 2003 Rose Revolution. A lawyer, educated in Kiev, Strasbourg and New York, who made his name as an anti-corruption campaigner. Saakashvili is both widely credited for having made transformational reforms and blamed for provoking war with Russia in 2008. Saakashvili’s second and final term as president expires in 2013, when he will still be only 45 years old. There is much speculation about what Georgia’s highest-profile politician will do next and whether he will seek a new political position, perhaps that of speaker of parliament. Vano Merabishvili The current prime minister, whose appointment on June 30 confirmed him as the most powerful political figure in Georgia alongside the president. He was previously the interior minister and country’s chief policeman for eight years and is associated with building up a powerful police force, and a highly successful “zero tolerance” policy against both petty and serious crime. He was also the man who twice (in November 2007 and May 2011) coordinated the dispersal of opposition demonstrations on the streets of Tbilisi and was criticized for his handling of the brutal murder of a young bank clerk Sandro Girgvliani. Bachana (known as Bacho) Akhalaia A figure of growing influence at the age of only 31, now in the powerful position of interior minister, having served previously as defense minister. A controversial figure associated with a successful campaign against organized crime but also with a poor record on human rights. His brother Data is now deputy defense minister. The rise of the Akhalaia brothers is seen as a triumph for the “strongmen” (siloviki in Russian parlance) in Georgian politics. UPDATE: Bacho Akhalaia resigned on September 20, after calls for him to be held accountable for the abuse documented in Tbilisi prisons. Akhalaia served as minister for prisons from 2005 to 2008. David Bakradze The current speaker of the Georgian Parliament heads the UNM’s party list for the upcoming elections. He has also served as foreign minister and minister for conflict resolution and is discussed as a potential candidate for president from the UNM. Bidzina Ivanishvili Georgia’s richest man had almost no public profile until he made a dramatic entry into opposition politics in October 2011. Ivanishvili comes from the village of Chorvila in central Georgia, made a fortune in Russia, chiefly through the bank Rossiisky Kredit and is now estimated by Forbes to be worth $6.4 billion. He returned to Georgia in 2001 and spent millions on philanthropic projects, many of them in partnership with the government. He is also a prominent art-collector. Ivanishvili says he hopes to become prime minister—but insists he would leave office after two years. Irakli Alasania Served as Georgian envoy for the conflict in Abkhazia until 2006, when he was transferred to become Georgia’s ambassador to the United Nations. He broke with Saakashvili in 2009 and founded a pro-Western opposition party, the Free Democrats. Still aged only 39 and well-known in the West, he may be Georgian Dream’s candidate for president in 2013. David Usupashvili Leader of the Republican Party, first founded as a dissident group in 1978, now a liberal opposition party. Married to fellow Republican Party politician Tinatin Khidasheli. Both are running for single-mandate seats in the October 1 election. Patriarch Ilia II Now aged 79, has been head of the Georgian Orthodox Church since 1977. The most trusted person in Georgian society by a wide margin, with a 92 percent approval rating in a recent survey. The patriarch rarely intervenes directly in politics, although he expresses support for conservative religious values and improved relations with Russia. He may be called upon to play a mediating role if there is continuing political confrontation after the election. In the parliamentary election of May 2008 the governing party won 119 out of the 150 seats in parliament, including 71 out of 75 of the single-mandate constituency seats. Since then, the electoral map has changed a little. There are now 73—two fewer—single-mandate seats, which will be won by the candidate who beats all others and wins more than 30 percent of the vote. The remaining 77 seats will be distributed proportionally to parties which receive at least five percent of the vote. The new electoral code has attracted various concerns. Opposition parties had called for there to be a smaller number of single-mandate seats on the grounds that the government has the advantage in these contests and can therefore win a parliamentary majority even without a majority of the vote. In 2008 the governing party won 59 percent of the vote but 79 percent of the seats. Another major controversy has been campaign financing. Under new legislation passed at the end of 2011, evidently to prevent Ivanishvili spending his own money on his campaign, a cap was placed on the amount individuals could donate to political parties of 60,000 GEL ($36,000). Since then Ivanishvili has been hit with several heavy fines for alleged violating party-funding rules. In July Ivanishvili paid the government a fine of more than 80 million GEL (more than $48 million), saying that he insisted the money be spent on the relief of flood victims in eastern Georgia. The United National Movement has also been fined a much smaller sum for receiving an illegal donation. The media landscape and the situation with television in particular is probably the most controversial part of political life in Georgia, and it has a major bearing on the election campaign. According to a recent study by Transparency International, more than 80 percent of Georgia’s population use television as their prime source of news. Two private pro-government channels, Rustavi-2 and Imedi, dominate viewing and are estimated to be watched for 60 out of every 100 minutes the average Georgian viewer spends in front of a television set. The two channels are by far the wealthiest outlets in Georgia and receive the vast majority of advertising revenue from one advertising company, General Media, which has a monopoly of the market. A third national channel, the state broadcaster Channel 1, is perceived as being more neutral in its news coverage, but it is also more sympathetic to the government. Two more pro-opposition channels Kavkasia and TV9, affiliated to opposition leader Bidzina Ivanishvili, have more limited coverage. Maestro, which is generally more critical of the government but more balanced, has a high audience in Tbilisi but less so in the rest of the country. Since it was launched in May, the pro-Ivanishvili channel and TV9 cable operator Global TV, owned largely by Ivanishvili’s brother, has complained of a government campaign to confiscate their equipment and limit TV9’s capacity to broadcast. The co-owner of TV9, Alex Ronzhes, a U.S. citizen, was detained for five hours at Tbilisi airport in June. Global TV attempted to hand out thousands of its satellite dishes for free but they were impounded for alleged violation of electoral laws. In response to international criticism, the Georgian parliament passed legislation entitled “Must Carry” on June 29, obliging cable providers to carry all television news channels for the duration of the election. The initiative has been widely welcomed, although it will apply to fewer than 200,000 households. Another row erupted with the confiscation of around 10,000 satellite dishes which the popular channel Maestro was intending to distribute in the regions of Georgia. Maestro strongly denied that it had any political affiliations and the actions provoked strong protests from journalists and non-governmental organizations complaining that the government was suppressing free speech. Both Saakashvili and Ivanishvili have been confidently predicting victory in the October election. This raises the specter that, in case of a UNM victory, the opposition will dispute the outcome of the election after October 1. This makes it all the more important for the election to be judged to be fair. The government set up an Inter-Agency Task Force to consider any complaints about violations of the electoral legislation. The task force has intervened in several cases to reverse political motivated dismissals of officials. However, as it is headed by chief government strategist, Giga Bokeria, secretary of the National Security Council, it cannot be said to be independent. The main opposition party, Georgian Dream, rejected an initiative by the governing party, the UNM, to sign a code of conduct which would commit all parties to accepting the election as legitimate if it is deemed fair by international observers. Georgian Dream said it was subscribing to an earlier seventeen-point rule of conduct devised by a group of NGOs and media organizations. There will be a large number of observers, both foreign and Georgian, monitoring the election. The OSCE has deployed a small long-term observer mission and plans to send 350 short-term observers to monitor polling day itself. All this means that is unlikely that the heated political temperature in Georgia will cool once the results are announced. There are two issues I want raise about the upcoming Georgian election that were not covered in Tom de Waal’s otherwise thorough overview. The first is that of the Georgian citizen diaspora and its role in the upcoming election. It is thought that up to a quarter of all Georgian citizens are living abroad. This is one of the highest percentages of citizen diaspora of any country anywhere. Few register and vote, however, due to extremely restrictive registration requirements instituted recently (curiously, in the middle of the campaign cycle). The most restrictive, and quite malicious, is the requirement that Georgians prove to Georgian authorities (not the host country authorities) that they are living legally in their host countries. In fact, the Georgian Ambassador to France was quoted as saying that Georgians living abroad illegally will not be allowed to vote in this [October 2012] election. For some reason, and by unknown authority, the Georgian authorities have taken it upon themselves to police the immigration status of its citizens living abroad. More disturbingly, the Georgian authorities have linked the immigration status of its citizens to the exercise of the constitutionally guaranteed right of suffrage. And, in another recent decision that really serves to disenfranchise even more of its citizens, the Georgian government will not open any polling stations in the vast territory of the Russian Federation even though most Georgian citizens who will be abroad during the election are living and working in Russia. Fair and representative elections assume free and unfettered access to the ballot box for all citizens. The approach the Georgian government has taken toward its citizen diaspora’s participation in the upcoming election – especially considering the disaspora’s sheer size and percentage of the citizenry – calls into question their real commitment to managing the kind of election that Secretary Clinton has urged them to conduct. Thank you Thomas de Waal for this accurate and balanced presentation; I have read almost every article written about Georgia for the past months and what strikes me is how much polarized is the Georgian society. The supporters of the UNM claim that Mr. Ivanishvili is a Russian stooge who will buy everyone out and who will destroy what his been already built. Georgian Dream supporters accuse the Saakashvili's government of being autocratic, that there is no rule of law and that there is widespread elite corruption. I personally believe that the truth is not black or white but somewhere in the middle. No one can deny the huge progress that Georgia has witnessed in the past eight years, Georgia has become one of the safest European countries, power supply is regular, gas, water are secured to (almost) everyone; 4 million visitors in Georgia in 2012 compared to 130 thousand in 2003; delegations from both western and developing countries are lining up to learn about reforms and how to implement them; Having mentioned all the above I fully agree with Mr. Ivanishvili's party that there is no rule of law, that citizens can be arrested, harassed and persecuted for their political orientation, that businesses are terrorized and subject silently to systematic milking and that unless "very close" to the authorities a businessman cannot expand his activities; I also agree that major businesses are controlled by people in power, The weakness of Mr. Ivanishvili's coalition is the background of several of his allies that are perceived to be corrupt, ruthless and fanatic; in other words if ever in power this coalition could bring back the country to the 1990's and this is something that no Georgian would like to see happening. The interest of the country would be to have the UNM in power again however with Mr. Ivanishvili's opposition as a very strong and powerful minority in Parliament to insure proper checks and balance. If so happens the UNM government will carry on both reforms and modernization of the country however with no teeth anymore for political persecution and hopefully with a fair and independent judiciary.